Yes it’s December and temperatures are dipping into the 30s at night, but fall in western Oregon is fickle and so you may just get surprised by an amazingly sunny and comfortably cool day. When these days come, grab your hiking boots and head to a trail! 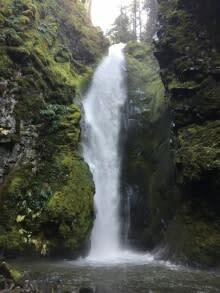 I explored the waterfall information on the Eugene, Cascades & Coast website and, since I was fairly committed to seeing Spirit, Moon and Pinard Falls, I went directly to those listings to find the driving directions. Overall, I felt the directions were easy to follow. Heading south on Interstate 5, I exited at the first Cottage Grove exit and turned east to follow Row River Road. You can follow Row River Road around Dorena Lake or travel around the south side on Shoreview Drive, which rejoins Row River Road on the east side of the lake. From Cottage Grove to Forest Service Road #1790 is roughly 29 miles (46.7 km) on paved roads and there’s a pit toilet at the falls turnoff. 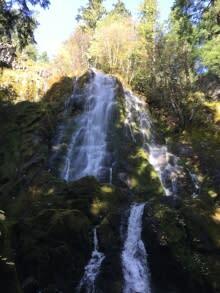 As I turned up Forest Service Road #1790, I didn’t see a sign for Spirit Falls trailhead and so decided to continue to Pinard Falls, stop at Moon Falls and finish with Spirit Falls on the way out. The road to Pinard Falls is gravel, but in good shape. 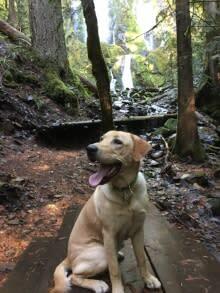 Trailhead signage was easy to find and Baxter the Adventure Dog and I found ourselves alone on the trail. The sunshine beamed through the tall firs and the air was crisp as we headed down the trail. 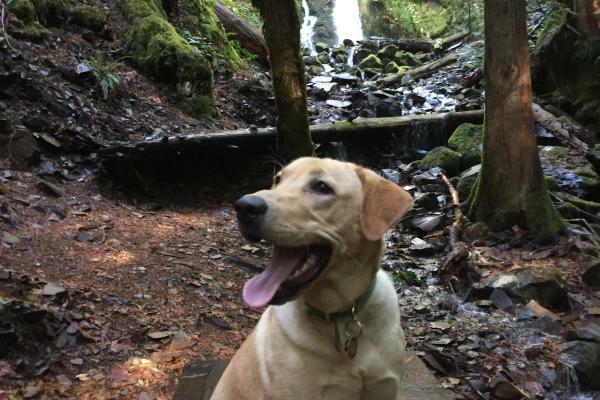 With no one around, Baxter was afforded the opportunity to be off leash and he took full advantage of this freedom to run ahead on the trail and pick up any and all sticks. There are several steep sections on the trail, which is signed as being one-half mile (.8 km) to the falls. It seemed a bit more than a half mile, but whatever it is it won&apos;t tax anyone too greatly. Considering the rainfall this year is about 75 percent of normal, I thought the water flow may not be sufficient to show off the power of the 100-plus feet (30.5 m) Pinard Falls. Boy was I wrong! The flows were more than adequate and these falls are a spectacular sight. After a few photos, it was time to move to Moon Falls. Three miles back down Forest Service Road #1790 and then right on Forest Service Road # 1702-728 for 3 miles (4.8 km). This road was a bit rougher than Forest Service Road #1790, but the hike to Moon Falls was a stroll in the park as the trail wound gently toward the sound of the falling water. Moon Falls was my favorite of the three as water cascades over a larger rock outcropping to create a misty sheet of water. Flows split in various directions creating intermediate pools before joining together back in the creek below. With the lower water flow it was easy to cross the creek and get up below the falls for photos. The picnic table along the creek made for the perfect staging spot for Baxter to show how much fun he was having. Arriving back at the trailhead we were greeted with a young family who had packed a lunch and was unloading for their trek down the trail. Now it was time to find the trailhead to Spirit Falls, which I once again drove right by. Back up Forest Service Road #1790 and there’s a turnout on the right about .1 miles (.16 km) up road. Low and behold this was the trailhead. 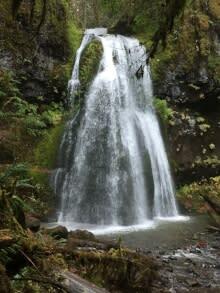 The well-maintained trail was gently sloped and it made me wonder how small Spirit Falls might be. To my delight it was another impressive falls. Several picnic tables are located near the falls, providing an opportunity to enjoy a meal with family or friends. Three waterfalls within a few miles of one another, well-maintained trails and hiking that is easy to moderate makes Moon and Spirit good candidates for families with small children. Pinard is one that smaller kids may have more difficultly with and there are several sections where the trail falls off sharply, so you’ll want to have the kids stay nearby an adult. We passed a couple of vehicles along the Forest Service roads and it was difficult to tell if they were looking for firewood, cutting a Christmas tree, mushroom hunting or hunting for deer. The general rifle season had ended by this time, but bow hunting and muzzleloader hunting may have been open. I didn’t hear any shots fired or chainsaws the entire time I was there, but it’s good to be aware the forests are used many people for many activities. I departed heading east on Forest Service Road #17, connecting to Forest Service Road #5840, rather than backtracking to Cottage Gove. It’s 10 miles (16 km) to where Forest Service Road #5840 and comes out on Highway 58 at Schweitzer Creek. The road is gravel, but can be safely traveled at 20-25 mph. I passed a group of energetic mountain bike riders making their way up Forest Service Road #5840 toward the summit. This route is a challenging choice and only for those in good shape! Once at the summit, cyclists head west to Dorena and can connect into the Covered Bridges Scenic Bikeway that dispatches you into the heart of Cottage Grove. And, it’s pretty much downhill the entire way once riders connect with Forest Service Road #17. For road cyclists there is a paved option that connects Cottage Grove to Oakridge via Brice Creek Road. No crowds, no mosquitoes and no rain. Fall in western Oregon may be the best time of the year. Baxter sure thought so! Andy Vobora works as Travel Lane County's Vice President of Stakeholder Relations. Andy has lived over 40 years in Lane County, and is a UO graduate and former football player. When he is not at work Andy enjoys drift fishing the rivers, cycling in the foothills and wine country and officiating high school football each fall. In spring, his passion for track and field has led to 29 years of officiating/volunteering at Hayward Field.